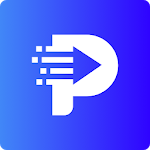 This coding and programming app is created using research and in collaboration with Google experts and offers a perfect path to learn programming. You will learn to code like an expert, and also enjoy it like a game. It's easy, it's fast and it's fun! ❇️Google Play's "Best of the Best" of 2017! ❇️Recognized and backed by Google launchpad accelerator?
? ?‍?Learn Java - Java is an object-oriented, general purpose, high-level programming language. 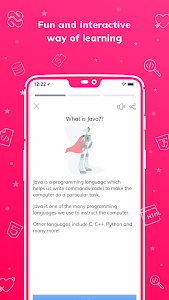 Today Java is being used to develop a range of software like web applications, J2ME Apps, Embedded Space, Android, Big Data analytics, etc.
? ?‍?Learn C Programming - C programming is a powerful general-purpose language. If you are new to programming then C Programming is the best language to start your programming journey.
? 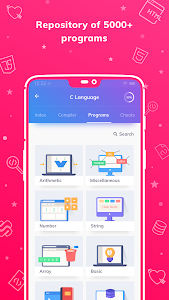 ?‍?Learn C++ - C++ is used nearly everywhere for everything from systems programming, numerical and scientific computing, web development, writing compilers, console games, desktop applications and so on.
? ?‍?Learn HTML - HTML is the standard markup language for creating web pages and web applications. HTML is most commonly used as the format for online documents i.e web pages.
? ?‍?Learn R Programming: R is a programming language and software environment for statistical analysis, graphics representation, and reporting. 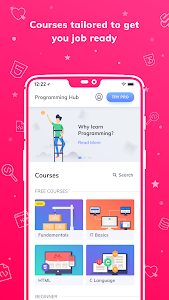 ?Programming Courses: To make your learning more interesting, our experts have created bite-sized and interactive courses which will help you learn programming like never before. It's the best place to learn new concepts. 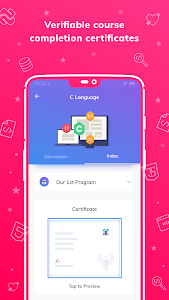 ?Programming & Coding Examples: 5000+ programs in 20+ programming languages and counting, programming hub has one of the largest collection of pre-compiled programs with output for practice and learning. 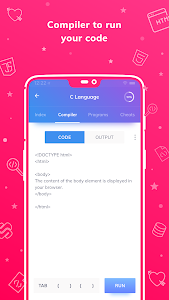 ?Compiler: The fastest compiler in the world on Android with support to compile and run over 20+ programming languages. Similar to "Programming Hub: Learn to Code"